Peel favourite and enduring underdog Ron Sexsmith has carved out his own brand of folk-pop you could call ‘positive pessimism’ – the bittersweet lament of the optimistic failure. He delighted 500 fans tonight with an intimate gig at the Komedia, but ultimately threatens to remain in the shadows of mainstream pop. 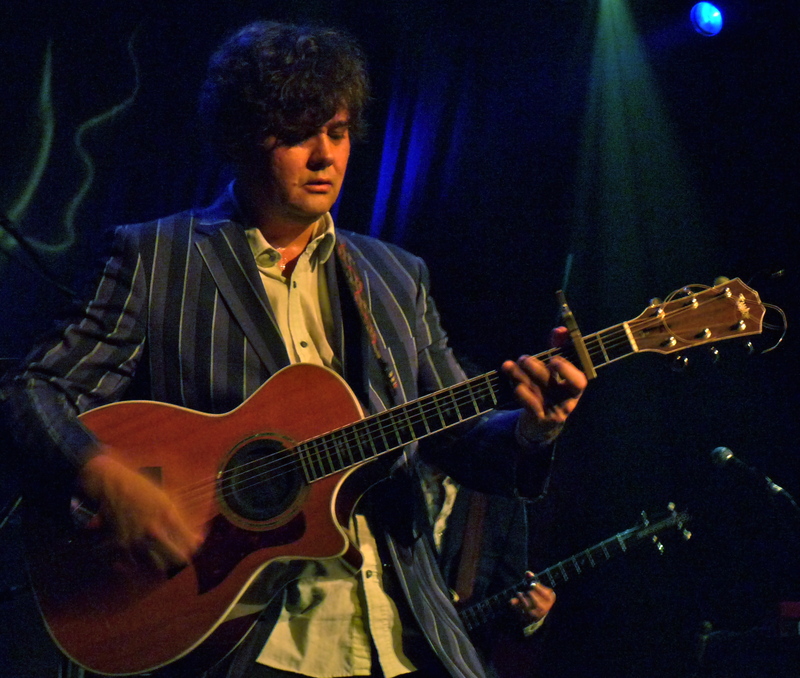 Starting with his first album 20 years ago, and completing 11 since, Ron Sexsmith has always attracted a diehard following. Although he seemed happy to remain a purist bedroom folkie, it’s become increasingly clear that Sexsmith wants the major success afforded to peers – and fans – such as Paul McCartney, Elvis Costello and Steve Earle. Latest album ‘Late bloomer’ marks a concerted effort to break through to the big time. Aerosmith producer Bob Rock adds commercial polish and MOR sheen, and the songs are some of Sexsmith’s strongest yet, but still this Canadian 47 year old knows he’s up against it. As the title track attests: ‘I’m a small player with a tall order – to come out on top’. Sexsmith proves a surprisingly confident performer tonight, backed by a polished band of dads in pork pie hats (the bassist is the spit of David Thewlis – aka Professor Lupin, young ‘uns). He takes the stage in a striped blazer and trademark moptop, is characteristically asexual and youthful, funny and engaging between songs – and clearly thrives off crowd reaction. Openers ‘Thinking out loud’ and ‘Cheap hotel’ give him a chance to settle in his voice which shows little impact from a cold he’s picked up. ‘The reason why’ and ‘Middle of love’ from the new album get the hips creakin’ amongst the roaring 40s and nifty 50s audience. The warm and clear vibrato is always a feature and reminiscent of Roy Orbison, and the band at their best surround and support his finger picked guitar without overwhelming it in the glossy production that features on the record. In ‘Hard bargain’ – written for Emmelou Harris – the band’s harmonies really lift off and my toes start to hurt from all the tapping, my cheeks from all the smiling. The latter’s opening lyric ‘I’m a bit run down but I’m OK’ is particularly classic Sexsmith that keeps me grinning all the way home. And he can do sad too – oh boy. Tears threaten to roll during ‘Love shines’ (sample lyric ‘In every nowhere town, there are somewhere dreams’) – yet another highlight from ‘Late bloomer’. ‘Gold in them hills’ – which Sexsmith introduces as written with Bing Crosby in mind – is another bittersweet highlight. A slow, swinging, dirge it achieves more than all the self-help books in the world with words like ‘…all the rain clouds are fountains, though our troubles seem like mountains’. Although the band support these songs beautifully, one wishes there would be more of Sexsmith playing alone – such as when he opens the magical 1995 track ‘Secret heart’ by himself, and goes solo completely on first encore ‘God loves everyone’. And it ain’t all bitterness and light. Perhaps it’s because standards are generally so high, that songs that fall short of brilliance just grate. Country ditty ‘Listen’ – with sometime songwriting partner Don Kerr – felt brash and out of place; ‘Jazz at the bookstore’ was awkward boogie-woogie amongst the rest of the folk-pop set. So…a songwriter of often breathtaking ability with lyric, voice and guitar – and a pop instinct to die for…what’s stopping him? Perhaps it’s the lack of variation in the subject matter, the focus on melancholy, the lack of a dumb hook and 80s beat. Maybe it’s because he can’t really convince people he wants to be a megastar. Well, whatever the reasons, I know I love him – and so do the other 500 positive pessimists in the room tonight. He may just need to be content with that.